Annual flowers are characterized as a variety of flower that grows, blooms and dies all within their growing season but not without providing a stunning show. Summer-blooming annuals often times begin their season in late spring to last into early fall. They produce masses of bright and colorful blooms that are a staple to the garden and look attractive when tucked into containers or planted within perennial beds and borders for added bursts of color. Zinnia (Zinnia elegans) is a fast-growing annual flower that begins blooming in late spring to last into early fall. They grow between 6 and 36 inches tall and have a maximum spread of 8 to 12 inches wide. The 2-inch-wide single, semi-double to double flowers range in colors from pink, orange and red to purple and white and attract butterflies and hummingbirds to the garden. Zinnia are hardy annuals flowers that are both deer and drought-tolerant. Their bushy foliage and masses of blooms help to make up the clumping growth habit they are known for. Zinnia grows best in full sun and fertile, well-drained soil. To promote a long flowering season, deadhead the spent zinnia blooms. Zinnia is hardy in all USDA zones. Cosmos (Cosmos spp.) is an annual flower that blooms from spring into early fall, creating a long blooming season. They grow 36 to 72 inches tall and have a spread of 10 to 12 inches wide. The daisy-like flowers on cosmos grow in a wide range of colors, including red, white, yellow, pink and purple, and attract butterflies to the garden. They have a clumping growth habit and bright green, fern-like foliage that makes an ideal annual to grow along a border or used as a fresh cut flower. Cosmos flowers require full sun and well-drained, nutrient-rich soil that is moist. To ensure a long flowering season, deadhead old cosmos as soon as they are visible. Cosmos are hardy in all USDA zones. Geranium (Pelargonium x hortorum) begins blooming in late spring to last into early fall. It grows 12 to 24 inches tall and has a spread of 12 inches. Geranium flowers are made of fluffy, five-petaled clusters that grow in a wide range of colors, including pink, red, white and some variegated flowers that have more than one color swirled together. Over summer they produce an abundance of flowers, especially when they are consistently deadheaded to remove the old flowers. 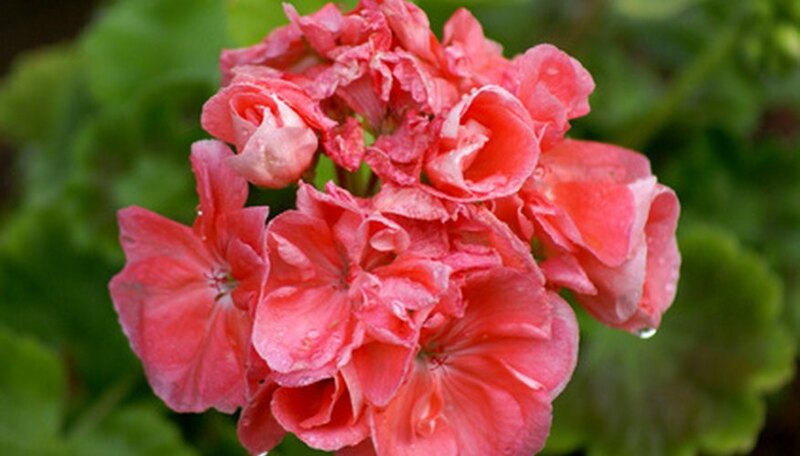 Geranium grows best in full sun to part shade and well-drained soil that is neutral to alkaline. They are suitable in all USDA zones.